Home > TechEntice Byte > What ‘the birthday paradox’ works on? What ‘the birthday paradox’ works on? A concept used in one-way hash function cryptography attacks, BIND attacks, in roulette, lottery, even estimating DNA sequence collisions or the chances of duplication of your SSN no. (if you are American that is); the birthday paradox is a phenomenon that deals with the probability of repetition. Traditionally it started with trying to figure out what the chances are of two people having the same birthday (of course excluding twins). Assuming it’s not a leap year and that there is even possibility for each day to be a day of birth; the chances that G-one and Ra-one have the same birthday is 1/365; these two are independent events after all. Now if you ask what’s the probability that 2 out of 3 people under consideration share the same birthday; you are dealing with three combination of matches…3-1,1-2,2-3. With this component we can compute a 100% chance of collision when k=n=365.What is the no. of people(k) required to have at least a 50% chance of repetition? 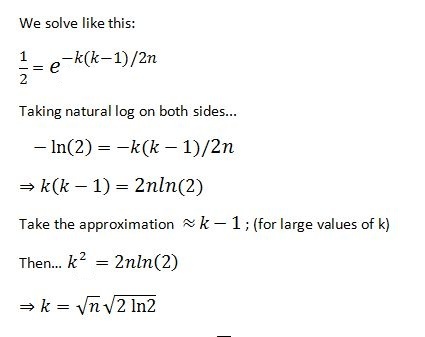 This gives us… k≈1.174√n ; which means that given ‘n’ no. of possibilities of occurrence of an event, we need 1.174 times the sqrt of n to have a 50-50 chance of the event repeating. This is significant; chances of collision are intrinsic to a lot of concepts. 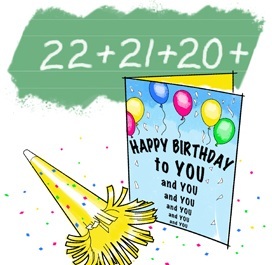 For the birthday case which started all this; we see that with n=365, required minimum k becomes 22.49 or approximately 23 people (with a little bit better than half chance of a match). We will look at some of its applications in the next segment..